But, this Mercury News piece - which ranks the best and worst Disney ride/attraction makeovers lists Nemo as a win and Tarzan's Treehouse as a draw. And, Splash Mountain? I mean...that's an awesome ride, right? He also was associated with the Walt Disney Family Museum as a show producer and consultant, so clearly he was an important and well-liked part of Imagineering. But, as for the quote above - it is all about how Disney Parks stir that notion of nostalgia in all of us. Or at least *some* of us - like me. They used that version of "Forever Young" as the departing music from the World of Color show at Disney's California Adventure. Here's the song with the little goodbye greeting at the very beginning. 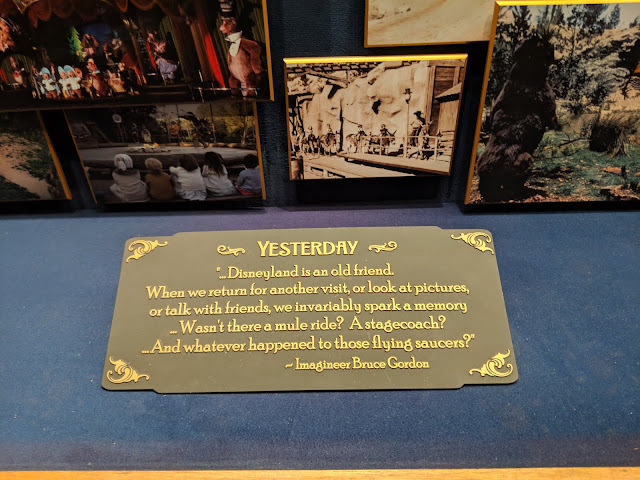 Down at WDW, they use other Walt Disney quotes in various ways including on signs on their construction walls. I've covered a bunch of those including this one about wanting guests to feel like they're in a different world. Rest of the signs are here. They know what they're doing. And it certainly works for a segment of the population. Pluralities of all parents, millennials included, said they would prefer to attend theme parks that feature characters and worlds from movies, television shows or cartoons of their childhood over parks that host their children’s favorite characters or themes. Nostalgia is a magical drug.